With the agreement signed 15 March by CNES and ESA concerning development of the Alphabus spacecraft bus, Europe intends to remain a key player in the world market for very-high-power satellites. ESA and CNES recently reached a major milestone in the development of the European Alphabus spacecraft bus designed for new-generation telecommunications satellites. 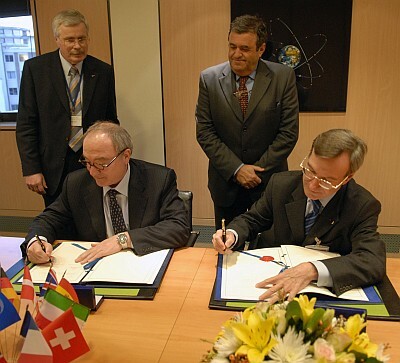 The agreement signed by the two agencies establishes the arrangements for cooperation between ESA and CNES in relation to the development and qualification of a generic line of large platforms, the provision of a flight model and its validation in orbit. Alphabus is designed for geostationary satellites with a lift-off mass of 6 to 8 t and a payload power of 12 to 18 kW. It will offer lower costs per transponder and reconfigurability, and will initially carry 200 high-power transponders and numerous antennas to meet growing demand from the telecommunications market. Alphabus will offer Europe reliable solutions matching world demand for very-high-power satellites. It will be marketed jointly by EADS Astrium and Alcatel Alenia Space starting in 2007. ESA will co-fund development of selected European equipment, making it the first client for Alphabus with the provision of a first flight model in 2009. With Alphabus, spacefaring Europe intends to remain a key player in the world satellite market.